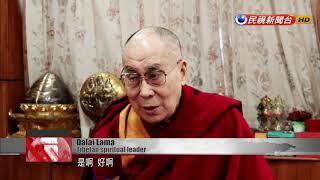 Over the Lunar New Year holiday, FTV Vice President Hu Wan-ling sat down with the Dalai Lama. In an exclusive interview with FTV, His Holiness gave an update on the status of his health. He even shared a part of his daily exercise regime. Follow our camera as we pay a visit to the Dalai Lama in India. The health of your Holiness is of great concern to many people. How is your health? Actually now I am 84 years old. So I am getting older and older. And actually, year by year, even if I lived a hundred years -- year by year, [I am] closer and closer to death. It is unavoidable. But important is while I am alive, my life should be something useful to serve other people. To share my own experience on how to develop inner peace. And then, I am Buddhist, the Nalanda student. So to these Buddhists, including some scientists, traditionally not Buddhist but showing interest about some of Buddha's real thinking, how to train our mind. That philosophy. That is quantum physics. So I serve them as much as I can. So then I feel that my life is something useful. Can we have a deal? Ten years later, we have an interview again. Either here or in Taiwan. OK. Maybe we don't have to wait 10 years. Do you do exercises every day? Can you show the exercises you do to maintain your health? Show us. Altogether nine times. Long breathing. That is a part of the practice.